Oh my god, do you guys know about dishwashers? They are pretty great. I just moved into a new apartment with many lovely features, including a backyard & garden in which I have some little sprouts growing and some really nice stained glass windows and a big lovely kitchen with a dishwasher! This thing just washes your dishes for you. I can sit and have a cup of tea, and the dishes are being washed by a robot. It's the best thing ever. I can't recommend it enough. I feel like I have won the lottery, but more so. I shall endeavour to never live dishwasherless again. I just put the bowls and spatulas from this recipe right in there, and the elves that live in my dishwasher cleaned 'em right up. These crispy squares are a teeny, tiny bit more work than the standard version, but not too much. And it's totally worth the wee bit of extra effort for the nutty, toasty, toffee flavours. Toasting the cereal and roasting the white chocolate is quick and easy, but they add depth and toffee-nuttiness. Puffed rice cereal is classic, but you can use any puffed grains. I used a combo of rice and millet. Blond chocolate is overly-sweet white chocolate's grown up sister - toasty, nutty and toffee flavoured. White chocolate skeptics will be convinced. If you roast two bars of chocolate you can save half for snacking, melting over ice cream or folding into cookies. Some super fancy chocolate brands even sell blond chocolate - if you can find some you won't even have to turn on your oven. On a cookie sheet, roast white chocolate at 265°F. Every 5 minutes, take the sheet out and smoosh the chocolate around with a spatula or bench scraper. It will seize and go all grainy and weird, don't worry! That's fine. Roast until chocolate is a deep toffee colour, a bit like peanut butter. Cool until hardened. Butter a 9"x 13" pan, or line with parchment, if you are too lazy to wash a pan (I am!). In a large skillet, toast the cereal on medium heat until it smells fragrant and turns slightly darker in colour. Let cool in a large bowl. Melt butter in a large pot and on low heat, add marshmallows, stirring constantly until melted. Add praline paste and vanilla and stir until evenly incorporated. Pour marshmallow mixture over toasted cereal and add hazelnuts and chocolate chunks. Stir until cereal is evenly coated in marshmallow goo and press into prepared tin. Sprinkle with flaky salt if you like. Let set for about an hour and cut into squares. I associate butter tarts with Christmas. When I was growing up, my family used to make dozens of butter tarts in advance and freeze them to eat over the holidays and bring to parties. Except that I developed a taste for frozen butter tarts and would eat directly from the frozen stash. We used to make them with frozen tart shells, which have a pleasing, slick quality and impossible identical thinness that I can never achieve with homemade pastry. I also find the homemade shells are often thicker than I like. I know I'm a blasphemer, but I think the pre-made shells were usually better. Transforming the tarts into bars with a gooey, just-set filling over a shortbread crust is quicker and easier, with no fiddly shells to fill, and the texture of the base reminds me of the frozen pastry shells. Making butter tart bars seems a bit less Christmasy than tarts, so I don't feel weird making them all year round. Butter tarts usually have either raisins or nuts; I prefer raisins. Their stickiness enhances the goopiness of the filling. Butter tarts were developed in Canada and they are very similar to American pecan pie, but they are always made in bite-size tarts rather than as one big pie. Except when they are made as bars! Preheat oven to 350°F. Blitz all ingredients together in a food processor until the texture of sand. Press into the bottom of a parchment-lined 9 inch baking tin. Prick all over with a fork, bake until pale gold, about 15 mins. Combine everything in a medium bowl, mix until evenly incorporated. Pour over hot crust and bake 20-25 mins, or until the top is crackly and crisp. The filling should still wiggle and jiggle a bit-it's very important not to overcook it so it winds up too set. Err on the side of slightly under baked. Cool in the pan and cut into squares. These freeze well, but they taste great frozen, so watch out for snacking accidents. I suffer from terrible indecision. Do I want a sweet snack or a savoury one? I don't know. If you are like me, rejoice, now you don't have to choose. 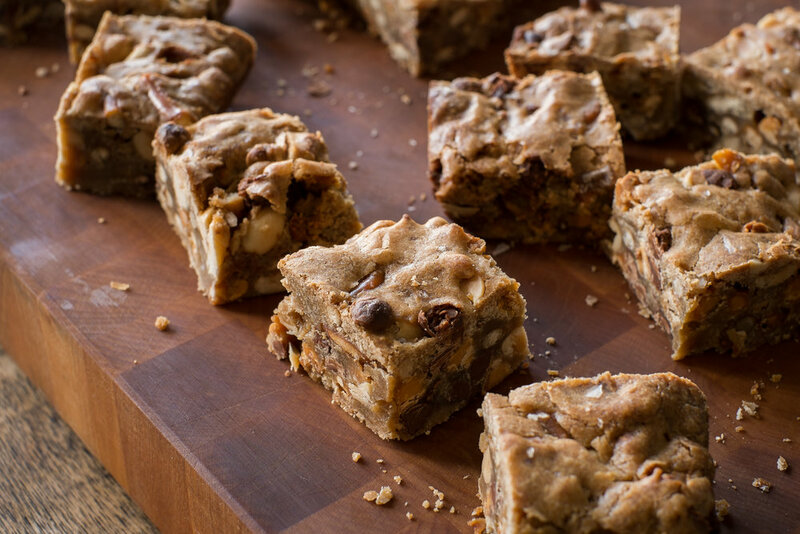 These blondies are essentially big chocolate chip cookie squares with a load of salty bar snacks folded in. You can have it all. Butterscotch chips have a lovely, toasty, smooth brown sugar sort of flavour, but they are just a bit too sweet. Kind of like white chocolate, they are sort of simultaneously appealing and a bit cloying. Adding in the salty snacks balances out the butterscotch chips nicely, giving little pops of salty and sweet as you eat. Combine butter and sugar. Beat in egg and vanilla. Stir in flour and salt. Add butterscotch and chocolate chips, pretzels and peanuts and mix in evenly. Spread evenly in a 8"x 8" pan lined with parchment paper and bake at 350 degrees for around 20 minutes until just set. They should be soft in the centre and just crispy around the edges. I like them just slightly underbaked, so they are chewy rather than cakey. Let cool a bit, but definitely try them still warm. Probably with a bit of ice cream. Like Holly Golightly's cat, these bars are nameless. Unlike Holly Golightly's cat, the reason for their namelessness is that their inspiration is a certain infamous pie, which is the registered trademark of some rather litigious individuals. Kern's Kitchen, who hold the trademark, like to make liberal and slightly terrifying use of the legal system to protect their pie. They have sued 25 times to protect it, with targets including cookbooks, restaurants and Bon Appetit magazine. In a fantastically Wizard-of-Oz-esque move, their production facilities include a curtained off area where the pie is mixed by the sole employee who knows the recipe. So these are nameless bars. And also like Holy Golightly's cat, these should never be thrown out of a taxi in a rainstorm. These bars are fantastical dessert hybrids, a sugary chimera: part gooey sugar pie, part buttery shortbread, with a touch of chocolate chip cookies goodness. Heat oven to 350°F. Line a 8" square pan with parchment paper. Crust: Combine all ingredients in a food processor and blend until the dough comes together in a solid lump. Pat dough into an even layer in the parchment lined pan. Bake until just beginning to colour, about 15 minutes. Set aside to cool. Filling: Mix together butter, sugars, egg, yolk, salt and vanilla. Add flour and stir until just combined. Fold in chocolate and nuts. Pour over crust, spreading evenly. Sprinkle the top with flaky salt. Bake for about 20 minutes, until top is crackly and golden but still wobbles a teeny bit when jiggled.